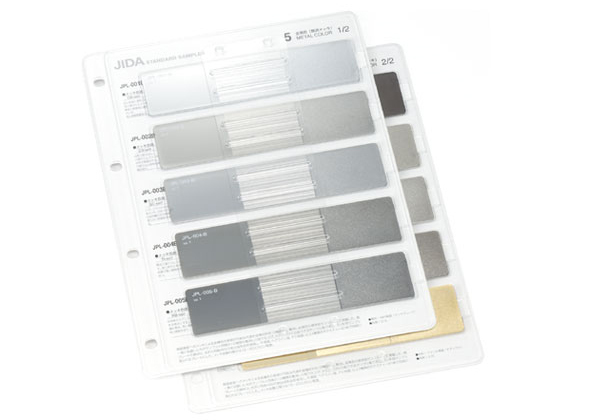 METAL COLOR (MAT):For mat metal texture we used the same 10 materials as those used in Vol.1. 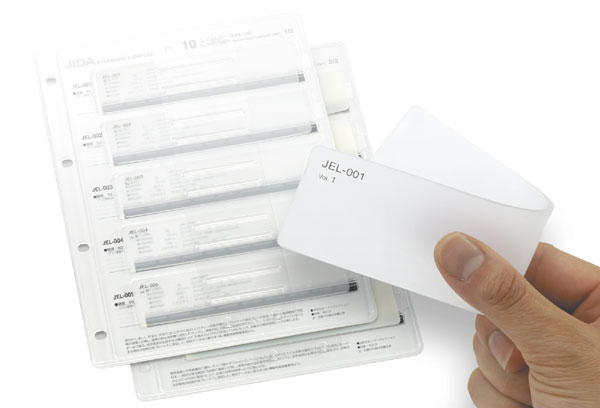 HALF MIRROR:The samples represent 5 tones made by adjusting the density of aluminum-evaporated film. METALLIC MOLDING:The variations of what we call metallic silver were formed by injection molding of the mixing material (acrylic). PEARL MOLDING:The samples of so-called pearl, a distinctive color, by molding the mixture of pigment and mixing material (acrylic). NATURAL RESIN:We have selected 10 kinds of resins that are commonly used in industrial products. CLEAR BLACK:The samples for each of the two elastomers, represent 5 variations on hardness. For mat metal texture we used the same 10 materials as those used in Vol. 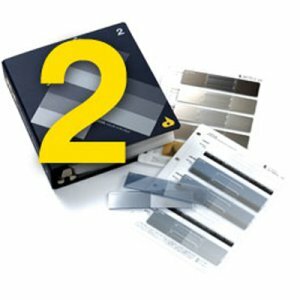 1 so that users can see a sheer contrast between mat metal and wet-look metal. 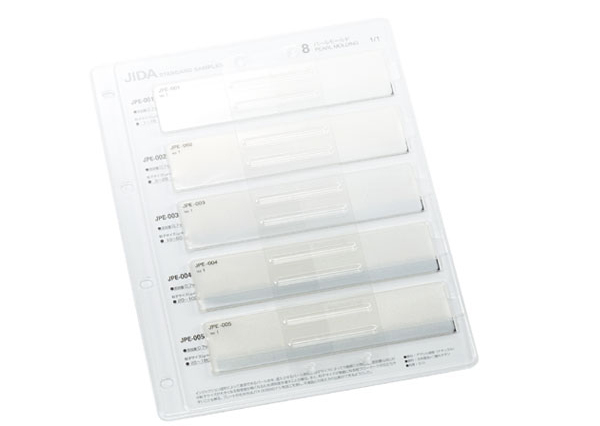 As with the wet-look version, we use injection molded ABS as the base of the sample plates. The metal coating layer is about 15〜20μm thick. 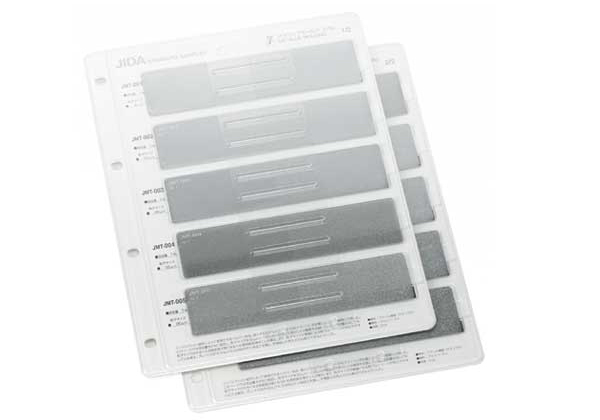 The samples represent 5 tones made by adjusting the density of aluminum-evaporated film. The grading degree was determined by means of visual perception. In order to create a fair expression of half mirror, we adopted a method to thermally adhere uniformly-evaporated films to the backside of transparent acrylic plates rather than directly evaporating aluminum to acrylic. The light transmittance is shown as the above. The variations of what we call metallic silver were formed by injection molding of the mixing material (acrylic). Our ten samples show how the tone differs by changing the content rate and the particle size of aluminum. 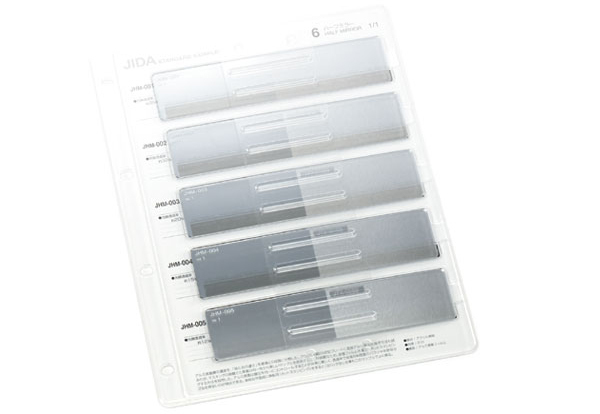 This sampleｒ consists of five grading tones made by adjusting the particle size between 5μm〜90μm with a fixed aluminum content of 1%, and another five tones using 30μm〜135μm particles and a fixed aluminum content of 2%. The right half of the plate has been crape-textured so that users can make a comparison with smooth surface. We formed the samples of so-called pearl, a distinctive color, by molding the mixture of pigment and mixing material (acrylic). With the pigment content percentage fixed at the most common 0.7%, we created well contrasted five grading tones by adjusting the pigment particle size between 1μm〜180μm. The right half of the plate has been crape-textured so that users can make a comparison with smooth surface. We have selected ten kinds of resins that are commonly used in industrial products, and created samples under uniform conditions. This kind of basic sampler that furnishes a comparison of as many as ten kinds of natural resins is actually an unprecedented compilation, though have long been expected, and therefore is of particular value. Furthermore, in-depth data including characteristics, properties and major applications of each material is stated on the plate mount, providing useful information that will help select materials. This is a sampler that is needed and useful, meeting diverse needs of various users, from students of materials science to professional designers. We provide two kinds of elastomers; namely, styrene block copolymer, which is soft, fair, safe and deserves to be called as next generation rubber, and thermoplastic elastomer polyester, which is superior in thermal adhesiveness with hard resins and suitable e.g. as grip part material molded by double injection. 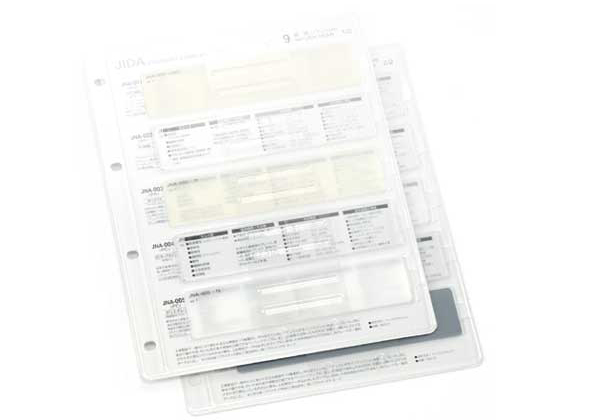 The samples for each of the two elastomers, formed by a regular injection machine, represent five variations on hardness that were determined within the commercially appropriate range. The particulars of each material are written on the mount beneath each plate so that users can easily get a clear picture of each material.